As the UK economy begins to slowly but surely creep out of recession, a multi-channel campaign‘Successful Modern Entrepreneur’ has been constructed aimed at providing SMEs a wealth of advice and networking resources to this critical economic sector. 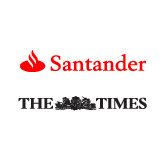 Cooperation between Santander, News UK Commercial and The Times has brought this campaign into life, and includes a series of live events, online, and print resources from business experts and high profile entrepreneurs. Ex-Dragon James Caan being one of these names! The ‘Live Events’ section of the campaign entails three SME (Successful Modern Entrepreneurs’) summits, the first of which took place on the 13th of November 2013, at the Science Museum, London. The summit on the 13th included several presentations from expert business journalists and high profile entrepreneurs, as well as a panel Q&A with Ian King, Ana Botin, James Caan, Lord Drayson and Paul Lindley. EventBeat got in on the act by reinforcing the social presence at the #SMEhub, and showcasing all the top tweets from delegates and speakers, along with some eye-catching twitpics from the event. The custom-branded Twitter Wall for the event itself was displayed on the IMAX screen housed in the Science Museum; a completely unmissable interaction feature for the event! As people began to reflect on panel discussions and talks, they were also able to voice their opinions during any breaks in the show, rather than having to wait until the opportunities in the live Q&A discussions. As the first event in this campaign, the hashtag ‘#SMEhub’ was being used by attendees for the first time both leading up to, and of course during the event. EventBeat broadcasted a total of 117 tweets and twitpics up onto the live IMAX Twitter Wall, displaying questions, opinions, and the experiences of people at the event. This added fuel to the social activity surrounding the event, and resulted in the event hashtag gaining a potential online exposure of approximately 2.5 million! Not a bad result for an event attended by only a few hundred people.